Buttery, flaky crust is filled with a sweet yogurt custard, then topped with fresh, tart blood oranges. Our blood orange tart is a delicious AND beautiful dessert, the perfect ending for a festive dinner. Our authentic straining process gives this VOSKOS® classic a thick and creamy texture that turns mealtime into a luscious treat. Preheat oven to 350 degrees. Place tart pan on a rimmed baking sheet and bake until crust is golden brown and set, 30 to 35 minutes. Let cool on a wire rack 10 minutes, then remove tart ring and let cool completely. In a small bowl, sprinkle gelatin over 2 tablespoons cold water and let stand 5 minutes. In a small saucepan, warm half-and-half over medium. When it begins to steam, add gelatin mixture and stir until dissolved, about 1 minute. In a medium bowl, whisk together yogurt, brown sugar, and pinch of salt. Stir warm half-and-half mixture into yogurt mixture. Pour filling into cooled tart shell and refrigerate until set, 2 hours (or up to 1 day). With a sharp paring knife, slice off ends of blood oranges. Following curve of fruit, cut away peel, removing as much white pith as possible. Slice blood oranges into 1/4-inch-thick rounds and remove any seeds. 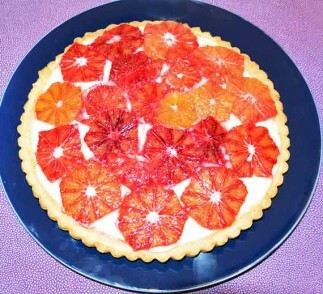 Just before serving, arrange orange slices on top of tart.